When you live in Japan you are probably going to miss many foods from home like nachos. Don't despair you can eat nachos in Japan. In this article we will show you how to find ingredients, cook, and do it cheaply without breaking the bank. Food stores in Japan stock a wide variety of goods but you will have to visit a lot of stores to find your ingredients. You will find them but it will take time. It is getting easier but is still very time consuming as no one store stocks all ingredients you need. 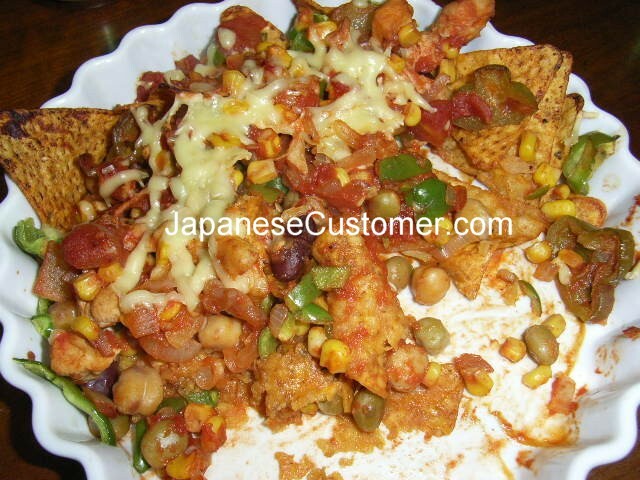 This recipe is aimed at making two serves of nachos for under 1000 yen. You may have your own preferences, ingredients and tastes. This is a basic recipe to meet a 1000 yen budget. No meat in this recipe. * Prices based on 2009 food prices. Prices may vary when you come to cook this recipe in Japan. You can find corn chips these days in supermarkets and convenience stores, pack sizes are mostly small and prices can very from 105 yen to 400 yen. Imported food stores can be better e.g. Kaldi or Donkey Hotei. Plain or natural corn chips are rare; most varieties typically have their own flavour, e.g., cheese, spicy or wasabi. It pays to shop around; you will be surprised how many stores carry corn chips. We buy at Donkey Hotei and get a 200 gram bag for around 300 yen. Vegetables can be picked up cheaply at your local green grocer. Beans can be found but also take time to find. We have been able to find Chick Peas, Red Beans and Three Bean mix in a large tin size (400 gram) at a number of food stores on occasion. If you do see beans at a good price always buy them when you see them as they likely won't be there next day or week. Stock & item turnover in Japanese food stores is very fast. Convenience stores have recently been stocking beans in cans, but size is small and price is high. We find imported food stores the best, e.g., Donkey Hotei for beans in term of range, variety and price. If you want to add avocado, sour cream and cheese you can often get these at large supermarkets. Avocado can be easily found and retails from 105 yen, sour cream is harder to find, often comes in small pack sizes and is very expensive e.g., 350 yen plus for a very small tub. Cheese comes in shredded and block forms. Small packets start from around 100 yen for 60 grams. 2. Cut up onion, slice and then dice and add it to a saucepan with a table spoon of cooking oil. Peel garlic clove, slice and dice, add it to saucepan. Small capsicums (piman in Japanese), cut off heads, pull out insides, wash under tap, then slice finely and add to the saucepan. Heat the saucepan on a medium heat and mix the vegetables gently until light brown. 3. Drain beans from tin and wash. Open canned tomatoes. Add beans and tomatoes to vegetables in saucepan and mix gently so as not to split the beans. 5. Heat saucepan and mix for approximately 15 minutes until contents is bubbling. You want to boil off liquid from the tinned tomatoes. Turn off heat mix and let sauce cool for an hour. Sauce will become thick. 6. Ladle half the sauce from the saucepan and spread it over the corn chips in the baking dish, make sure to cover all corn chips otherwise exposed chips may burn in oven. 7. Set the microwave to oven function, set the temperature to 250 degrees Celsius for 8 minutes. During cooking watch dish to make sure corn chips are not burning. 9. Repeat from step 6 for your second serve of nachos.